One day right before school started, we stopped by her house after making some deliveries, and she showed me this fun craft she was making to sell at the local arts and crafts fair the following month. It was an adorable pumpkin centerpiece made from dryer vents. I went home and made a few with my mom. So now every time I see one, I think of her. I am so glad that Jody enjoyed making these for us and now I’ll let her share how to make one of your own! 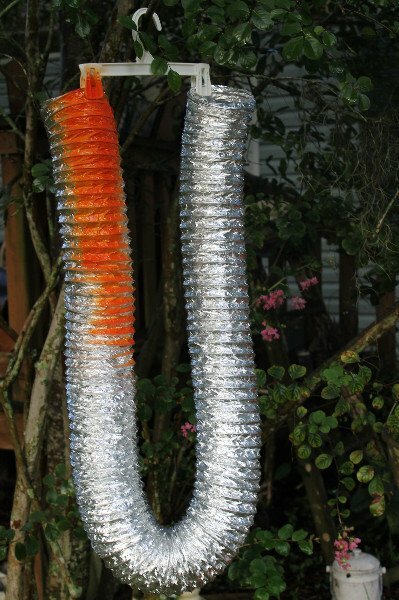 Stretch out dryer vent to full length, for easier painting I clipped either end on a pant hanger and hung it from a tree. Spray a light coat over length of the vent to give it a good tack coat, dry for 5 minutes. Apply 2-3 additional coats to cover well-Don’t worry if you miss a few spots, you can give it a final touch up after assembling. 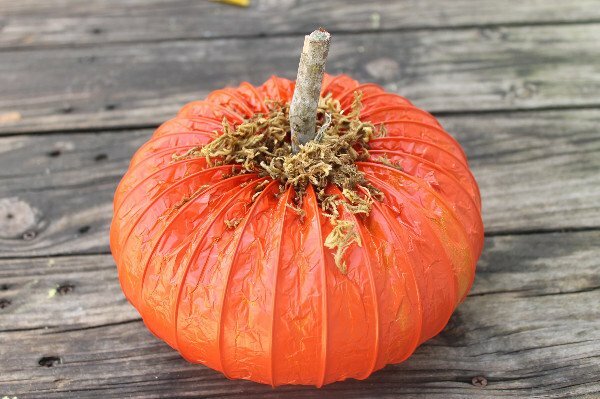 Cut dryer vent into desired length to make a pumpkin as large or small as you want, you can get an idea by drawing the vent coil into a circle. You will need wire cutters to cut through the wire coiling through the vent. With a hot glue gun apply a quick generous bead of glue halfway around one side, press the other end into it and hold in place until cook with clothespins. Repeat on the other half. At this point if you have foil showing you can touch it up with paint again. Let it dry completely before adding the final touches. 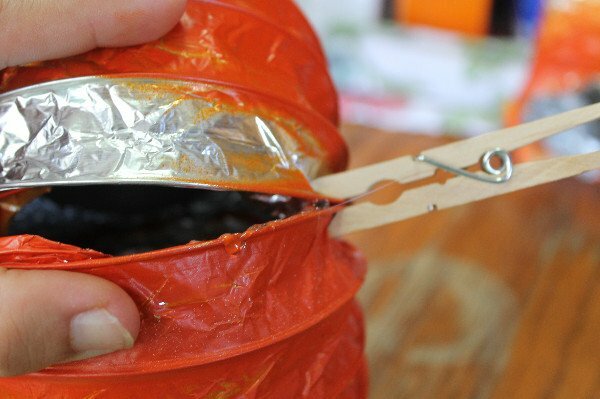 Adjust the coils to create a good shape for your pumpkin. 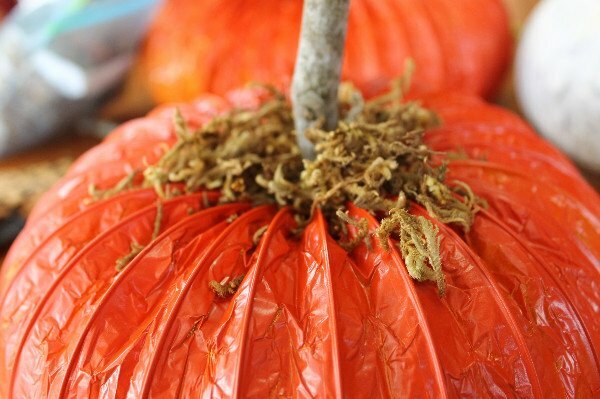 Place a generous amount of hot glue in the center of the top of pumpkin and press short stick into it for a stem. You may wish to add a bit more around it to secure. Top with moss to give it a bit more texture, imitate leaves, and make it a bit more realistic (maybe a little bit country). 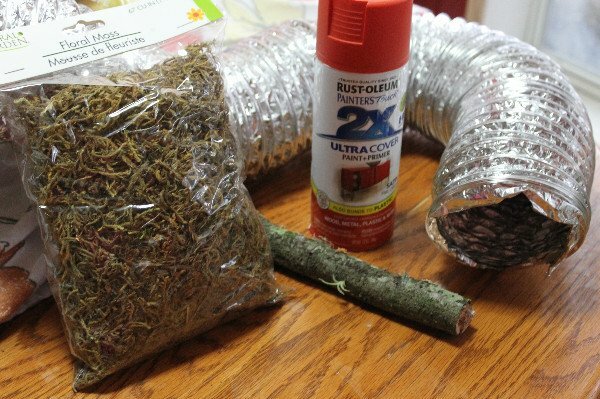 I did not shop around much, my dryer vent cost about $11, you can probably find it cheaper especially if you look for coupons to Home Depot and other stores through CouponSherpa.com. 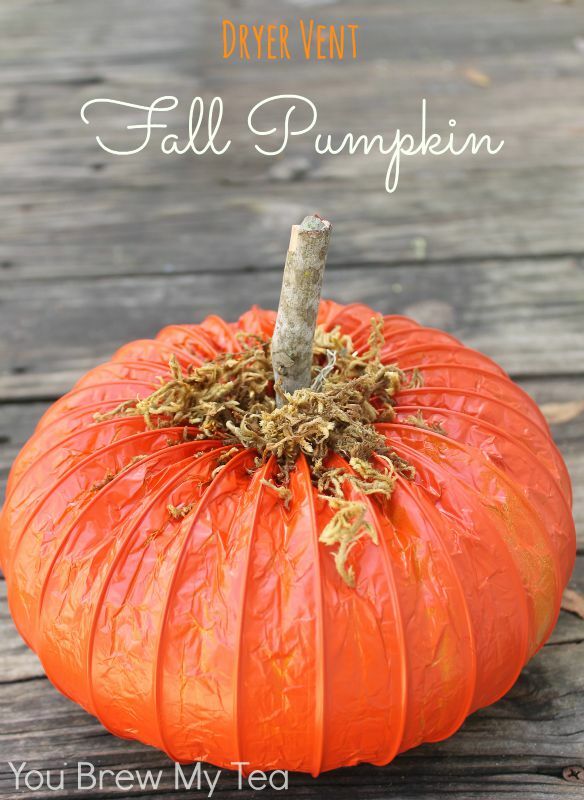 Since I was able to make three pumpkins from one I thought it was still a great value for such a cute DIY. I just love how it turned out, I gave one to my mother in law, and another to a friend but you could create a pretty grouping of them for yourself on a mantle or table. As you can see, this is a wonderful easy craft just in time for Halloween! This can be done with help from your kids, and use as a table centerpiece, gift for teachers or displayed on your mantle! 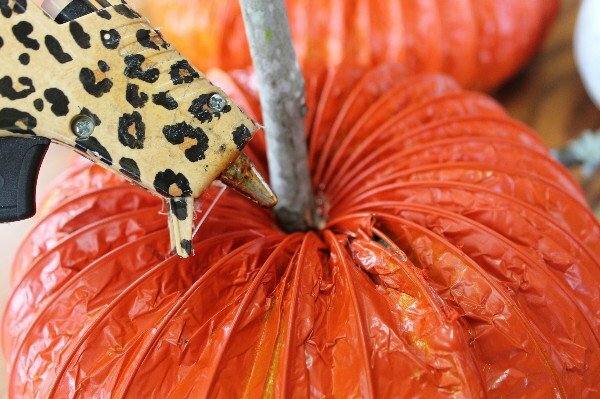 Check out our other favorite Fall & Halloween crafts! How creative! Love these and pinning. Absolutely love this! Pinning, thanks so much for sharing! I found your site through the Mix it Up Mondays link party. This is so creative, I pinned and tweeted it! I love this! Thank you for sharing with us at the Brag About It Link Party! Wow this is adorable! I totally want to make some for my porch! Wow this is so creative and pretty! This is just genius! I have never seen this done before and I love it! Thanks for stopping by!!! We love your party! Oh my goodness! What a creative idea! I LOVE, LOVE, LOVE! Thank you so much for sharing at The Wonderful Wednesday Blog Hop! I’m definitely pinning to our favorite’s board! I love this!! Can’t wait to go get some dryer hose to do this! Thanks for sharing on Idea Box! Love the idea. & it turned out so cute! Those are cute! And what a nice back story for the project. Thanks for sharing with us at the #HomeMattersParty link party. What a creative idea – I love it!! Pinning this, and probably whipping up a few this fall! It is so easy and fun! Thanks for stopping by! What a great idea!!! Plus, it’s inexpensive to make and you could put them anywhere…I love it! They are super cheap and fun to make! Thanks for stopping by! Thanks so much for including us!!! This is absolutely inspired! Congrats on your #HomeMattersParty feature. What a great idea. I think I have a spare dryer vent on the top shelf in out laundry room! This is so creative, it is perfect and appreciate that you have shared on Friday Features Linky Party this week. Hi Jody, Thanks so much for sharing with us at What to do Weekends! I love your sweet Pumpkins! Sucha cute idea! Pinned and featuring you tonight @ Shoestring Elegance. So glad you joined the party! Happy, almost, weekend! I love your pumpkin project. Repurposing projects are my favorite DIY projects. Thank you for contributing it to my roundup post that includes lots of great DIY Halloween decorating projects like yours. I’m sure my readers will appreciate your tutorial. Much appreciation.